Facebook like buttons are now everywhere on the Web—on products, status messages, and blog posts like this one. It’ so easy to like things—just one click—that people do it all the time. But what about when you are walking along the street and you see something in a window that you really like, or in a magazine, or a product you are holding in your hands? Up until now, you’d have to keep those feelings of mild approval to yourself, or resort to a Tweet. But soon, you may be able to actually like those things on Facebook as you run across them in the real world by scanning a mobile QR code—those 2D bar codes that look like television snow. A new service called Likify, created by Belgian company Boondoggle Lifelabs, just launched that allows marketers to add QR codes to products and signs, and then link those QR codes to a Facebook like button. 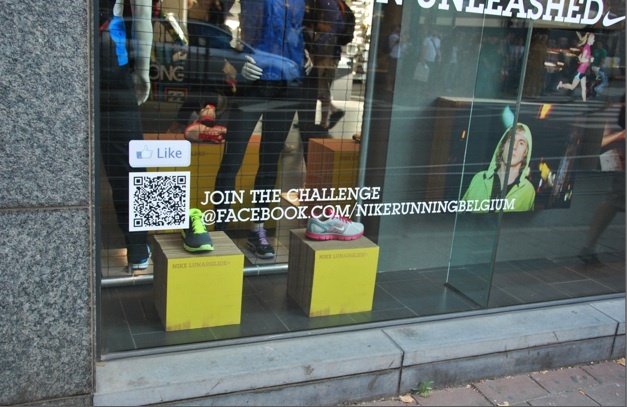 So that when someone comes along and scans the QR code with their cell phone, it triggers a Facebook “like.” Nike Belgium is using the codes in Belgium in a campaign to promote their shoes by getting people to “like” different crazy-shaped jogging routes. Engineers and brands love QR codes because they make it possible to link the real world to the Internet in interesting ways. 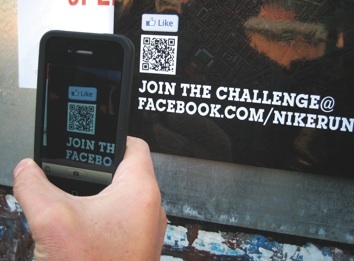 QR codes are popping up in all sorts of places. Google has tried to get local merchants to place QR code stickers in their windows which opens up that store’s Google Places listing on the window shopper’s cell phone. Starbucks uses QR codes for iPhone gift cards. They are starting to be use din mobile ticketing applications, and even Website links now can have their own QR codes. But whether or not consumers actually scan them is another question. I think so far, most people either don’t know what they are or even if they do, it’s too much of a hassle to power up your QR scanning app on your phone (assuming you have one) just to get a marketing message. There is no good reason to scan these things. Until QR code scanners become a default feature of most smartphones and they start to become actually useful enough for people to go through the trouble to scan them, they will remain a gee-whiz feature nobody uses.